The Savanna Moon slot of Gamomat is a five reels slot with three rows and selectable 5 or 10 pay-lines. For many years the slot was released by Bally/Wulff but now Gamomat as a manufacturer released the slot in its own name. The Savanna Moon Slot is like a typical slot from Novomatic and is very similar to Book of Ra or Columbus. In addition to some features in the base game, there is only one Free Spins feature you should trigger for bigger wins. From 10p to £ 20 you can spin the reels on all devices including Smart Phones with iOS and Android operating system. 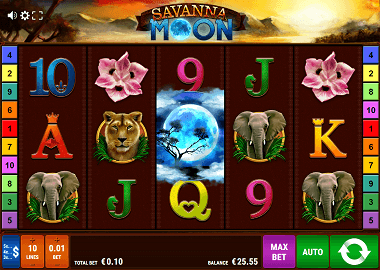 Symbols and payouts: The Savanna Moon Slot has poker cards symbols and themed symbols. The poker card symbols are 9, 10, J, Q, K and A. The highest payout here is 100x your bet if you land the ace 5 times on an active payline. The other symbols are suitable for the desert theme: two desert flowers, an old tree, an elephant and a lion. The last named symbol pays you 750x your bet for 5 identical symbols. But the most valuable symbols are the Scatter Symbol (the full moon at 500x your bet) and the well-known Explorer where you win 1000x your bet. Free Spins Feature: The Free Spins feature is the only bonus feature you can play at Savanna Moon Slot. To trigger the feature you need 3, 4 or 5 scatter symbols. You will then receive your instant win (5x, 20x or 500x your bet) and 15 free spins. During the bonus feature, you can add more free spins with new scatter symbols. All winnings are paid in the Free Spins feature with a 3x Win Multiplier. Here you can also trigger the top prize at the Savanna Moon Slot of 3000x your bet. Top Wild and Gamble: The Explorer symbol is the Wild symbol on the Savanna Moon slot and replaces all symbols except the Scatter symbol. In addition to the Free Spins feature, you can also use two different double features. After every win it is possible to double the win via Card Gamble. Just click on the Gamble button and you’ll double your profit or you’ll lose everything. The second option is the ladder gamble. Here you click on the ladder gamble button and you jump up a ladder with every doubling you make. Gamomat online slots and thus also the Savanna Moon Slot are offered in online casino also by Bally / Wulff and Merkur Gaming. There are a variety of casino where you can play these online slots. Gamomat is from Berlin and is the most successful software manufacturer in Germany. At the bottom of the table you will find online casinos like the LVbet or Energy Casino, which have the best selection of Gamomat online slots. If you click on the top of the Savanna Moon banner, you can also play the slot for free.